Use glue dots or staples. A beautiful, DIY book page paper bow! It is a lot of work, and it's not the best idea for quickly decorating the whole batch of presents under the Christmas tree, but this would be the perfect, unique touch on a special gift for a friend. This was my first bow; it's not perfect. But it's cute. I made this back in December but the photos got buried and I forgot to post it. This is so cool! I love it! 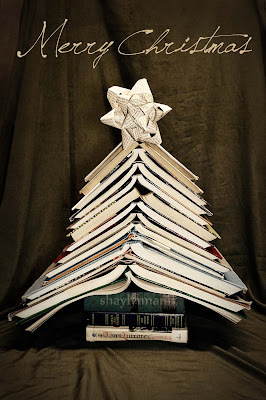 And also your book 'tree'! Now I have to go and find a book I can destroy! By the way, I've started following...hope you come follow me over at the Little Shack! What a great idea to make them your self. Nicer than the ones you bye.